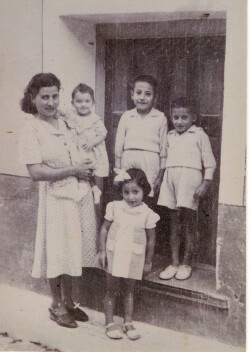 Above: My mother, Aspasia, is holding my sister, Panagitsa, while my brother, Stavros, and I are standing in the doorway and my sister, Marianthi, is next to my mother. 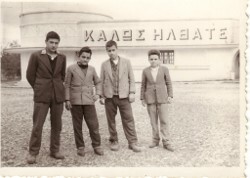 Above Right: We went to Kos to study Agricultural Studies. We did not last even two months, as we were already farmers. 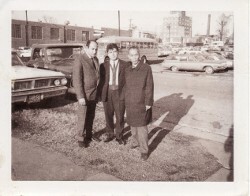 L-R: myself, Dimitrios Karekos and Kostas Sevastellis. Above: For over six months, I worked on merchant ships. While working on the Marlee, we stopped over in the United States. Here, i am with Kostas Tsetsenis and our Japanese electrician, Katakiri Haraturo.